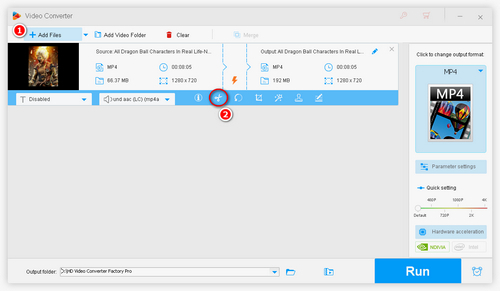 The superb tool to trim your MP4 videos with a few clicks. Some of you are expecting to trim and cut off unnecessary part from the MP4 videos you shot when you are going to share them on YouTube or other sites. Or you want to trim or clip MP4 files without re-encoding it. All in all, you just need a part of the MP4 file. If so, you need a handy tool to trim or split your MP4 footages. And this tutorial will recommend you a useful MP4 cutter and the specific trimming steps are demonstrated as well. 1. With direct ultra-fast editing algorithm, can trim MP4 files at one go. 2. More bonus video editing features: crop, split, merge, rotate, flip, add special effect, etc. 3. Clip MP4 videos with/without re-encoding as you wish. 4. 100% safe to use. No bundled ware, malware and NO watermark on output files. It’s quite simple to cut off unwanted part from MP4 videos now and you do not need to buy any costly and professional video editors to satisfy this need. WonderFox HD Video Converter Factory Pro is a versatile MP4 cutter and editing tool which equipped with basic video editing functions like trim, crop, merge, rotate, add special effect, create mirror effect and so forth. Continuous technical updates enable it to quickly cut video at 3X output speed. All you need is to free downloadfree download it and follow my steps to have a try. 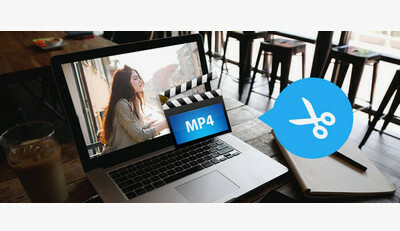 To cut MP4 files, launch this HD video editing program and you can load MP4 videos by clicking “Add Files” button or directly drag the target videos to this tool. Tips: You can also import other formats videos here and after the trimming, you can convert the original videos to MP4 format. Click the scissor-like icon to move up to the editing window. Drag the slider on the timeline to clip MP4 or remove the unwanted sections. 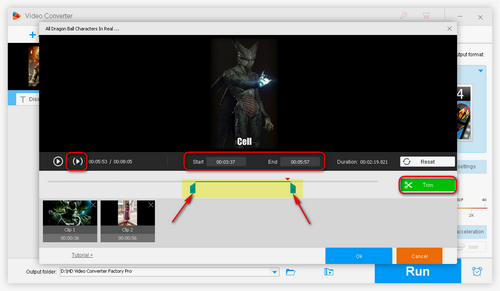 Or you can customize the “Start Time” and “End Time” to trim your videos more accurately. And clicking the “Play section” to preview the trimmed video. Don’t forget to hit the “OK” button to save the video. 1: For you who do not want to re-encode the video files, choose MP4 as the output format. 2: But if you want to transcode the video format for other purposes, select the needed one on the Video or Device section since this program supports to convert MP4 to MKV, AVI, MOV, MPG and other 300+ formats and devices. You can specify the output folder and after all has been set done, press the blue “Run” button to begin with how to trim MP4 process. The whole trimming process will be finished in a blink of an eye and find the final trimmed MP4 video in the output folder. Besides trimming MP4 files, you can take this MP4 cutter do more video editing work. 1: You can crop MP4 videos by clicking the “Crop” icon. 3: Rotate the videos 90 degrees clockwise or 90 degrees counter-clockwise. 4: Add mirror effect to the videos. You are able to flip the videos horizontally or vertically. 5: Add special effect to your MP4 or other videos, for example, highlight, darken, blur, sharpen, old film, etc.